Prevent electrical hazards with this theme's workshops, games, activities, and science experiments designed for children. 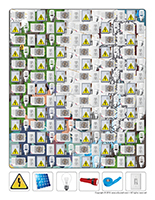 (Open thematic poster-Electricity) Print, laminate, and display all kinds of posters. 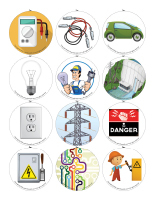 (Open educa-decorate-Electricity) Print, cut out, and laminate. Use the items to decorate the walls of your daycare and set the mood for the theme. (Open models-Electricity) Print. Let children decorate the garland. Cut it out and hang it within your daycare or near your daycare entrance. 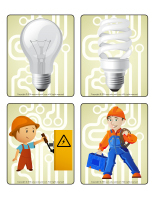 (Open educa-theme-Electricity) Print and laminate the items that represent the theme. Use them to present the theme to your group (and parents) while decorating your daycare. (Open stickers-Electricity) Print the illustrations on adhesive paper. Cut out the items and use the stickers to reward children. Set up a corner that will represent an emergency hotline for electrical problems. You will need telephones, cell phones, notepads, pens, an intercom system, an answering machine, and headphones. This special tool was created in response to a special request received. 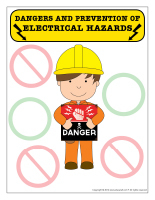 (Open poster-Dangers and prevention of electrical hazards) Print and laminate. 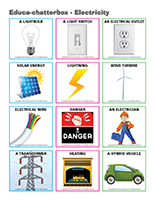 Use the poster during various activities to teach children about the risks associated with electricity. (Open Poni discovers and presents-Electricity) Print the various cards. Laminate them and cut them out. Use a Poni puppet or another puppet children are familiar with to introduce the pictures to your group. Set a variety of different objects in the centre of your circle time area: a cell phone, a lightbulb, wires, pliers, plastic outlet plugs, a charger, etc. Show children a picture of, for example, a light. Encourage them to find one or more object(s) related to the illustrated item. 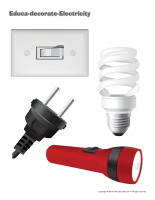 With your group, discuss items that require electricity (lights, heating, hot water, computer, etc.). 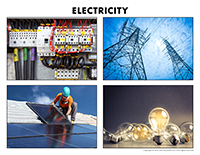 (Open picture game-Electricity) Print and laminate the pictures in the format you prefer. Use them to spark a conversation with your group and to ask children questions related to the theme. (Open picture game-Electricity) Use the pictures to decorate your daycare or to spark a conversation with your group. Print, laminate, and store the pictures in a Ziploc bag or in your thematic bin. 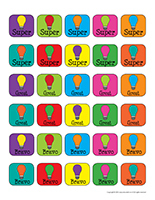 (Ope picture game-Electricity) Print the pictures twice and use them for a memory game. 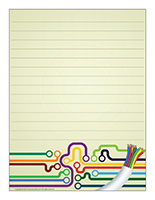 (Open writing activities-E like electricity) Print for each child or laminate for use with a dry-erase marker. (Open stationery-Electricity) Print. Use the stationery to communicate with parents, in your writing corner, or to identify your thematic bins. (Open activity sheets-Electricity) Print and follow instructions. (Open educa-spots-Electricity) Print for each child. Use bingo markers to add color inside the spots. If you don't have bingo markers, simply ask children to fill the spots with dry cereal or stickers. Display pictures of hydroelectric dams, transformers, power lines, etc. 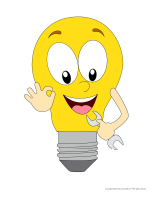 in your area and encourage children to build their own electrical systems. Different types of blocks (LEGO, wood, Krinkle, etc.). Wrap wooden blocks in aluminum paper. Cellophane paper, aluminum paper, and empty cardboard tubes to create electrical objects. Collages with sequins and glitter for electrifying creations. Empty tissue boxes and other recycled containers of all kinds along with yarn, string, ribbon, etc. for creating unique items (individually or as a group). Cardboard box to represent a television. Shapes that can be cut out and used to represent a variety of objects related to the theme. Aluminum paper or other types of shiny paper. 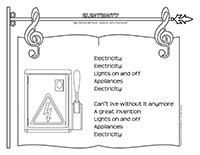 Coloring pages representing a variety of appliances that need electricity to operate. Silver, gold, and bronze crayons or gel crayons for drawing on dark paper. Computer area: Collect old keyboards, mouse devices, old CDs, etc. Use old cardboard boxes to represent screens and let children use their imagination. Television area: Use a large box to represent a television. Arrange sofas and chairs in front of your pretend television along with blankets, empty juice boxes and popcorn bowls, a few empty DVD cases, old remotes, etc. Radio area: Transform your role play area to make it look like a radio station. Children become DJs and radio hosts. Use the following: chairs on wheels, microphones, CDs, portable radio, remotes, headphones, etc. Display pictures of your favorite singers on the walls. 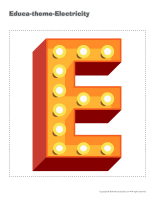 Memory game using educatall.com picture game or word flashcards. Modeling dough in a variety of colors to which you have added glitter. Different board games children enjoy. Variety of items related to the theme. Books that explain how a power plant works. Picture book containing pictures and illustrations related to the theme. Prepare a show that includes songs children can sing with a microphone. Make a video of their show and watch it on a television or computer with your group afterwards. Explore how hydroelectric dams operate. Study how wind turbines (wind energy) work. Explain how hybrid cars work. Use the cards to spark a conversation with your group or in your reading and writing area. They may also be used to identify your thematic bins. (Open word flashcards-Electricity) (Open giant word flashcards-Electricity) Print. Print and laminate the word flashcards. Each child picks a flashcard. Children take turns presenting their flashcard to the group (ex. an electrical outlet). As a group, discuss each item. Ask children questions about each object. 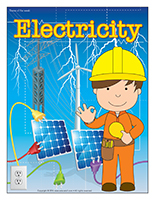 (Open educa-chatterbox-Electricity) Print and laminate the cards. You will need an empty shoebox or a tiny bin. Decorate your chatterbox as you wish. Fill it with tiny objects, illustrations, pictures, and various accessories related to your theme. We have prepared a printable document that is perfect for this activity. During circle time or as children are waiting for their lunch or snack, invite them to pick a card or item out of your chatterbox and name what they see. This activity is actually a variation of the well-known telephone game. Children sit in a circle. Whisper a message for the electrician in one child's ear. This child must repeat the message in the ear of the child sitting next to him and so on...until the message reaches the last child, the electrician. The last child must say the message out loud. Verify the exactness of the message. If the message is true to the original message, shout, "The current flows!" (Open story and memory game-Electricity) Print, laminate, and cut out the illustrations. Place them face down on a table or the floor. Children take turns picking three cards and inventing a story in relation to the illustrations. Trick: To solidify the illustrations, glue them on the top of frozen juice cans. (Open transition games-Electricity) Print two copies. Laminate and cut out the cards. Glue one copy of each card on the table using adhesive paper. Drop the other copies in a bag. Children take turns picking a card to determine their spot at the table for the day. You may also use the cards to determine naptime spots or for your task train. (Open transition games-Electricity) Print, laminate, and secure the illustrations on the floor to create a path which leads to areas frequently visited by children such as the bathroom or cloakroom. If you prefer, the illustrations may also be used to delimit your various workshops. Children form a circle, holding hands. When you are ready, signal to a child. He/she must squeeze the hand of the child standing to his right or to his left to represent an electric shock. This child must do the same and so on to make the electric shock travel all the way around the circle. Once the current reaches the first child, he/she must shout, "Electric shock!" For this game, you will need a parachute. Divide your group into two teams. Children from the first team sit under your parachute. Children from the second team hold the edge of the parachute and gently pull it from side to side to rub the heads of the children sitting under it. The result will be spectacular! Take pictures of their electric hair! Pick a child who will play the role of an electrician. He/she stands against a wall. The other children line up against the wall at the opposite end of the daycare. The electrician turns around and faces the wall. He/she can clap three times and say, "20, 60, 100 watts." During this time, the other players move forward as quickly as they can. They must come to a complete stop as soon as the electrician turns back around. If the electrician sees a child move, even just a little bit, he/she must go back to the wall. The first child who reaches the electrician can take his/her place for the next round. Provide several decks of playing cards. Sit on the floor with your group and have fun using the cards to build and represent hydroelectric dams. Use yarn or string to represent an electrical network that connects the children in your group. You can simply encourage them to toss a ball of yarn among themselves to illustrate what a network of electrical wires looks like and how it makes it possible for electricity to travel. (Open game-Electric shock prevention) Print and laminate. 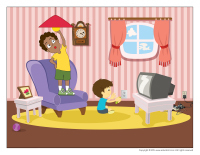 Children must identify electricity-related dangers. 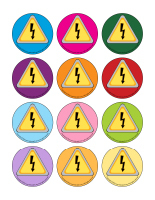 Use adhesive putty to stick the "danger" symbol on each risk they find. (Open illustrated enigmas-Electricity) Print, laminate, and cut out. In your yard, set up an obstacle course. At each stage, ask children to solve an enigma related to electricity. Of course, this activity can also be done indoors. Simply adapt your obstacle course to the available space. 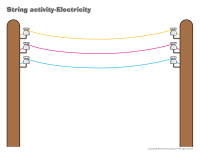 (Open string activities-Electricity) Print for each child. Children trace the outline of each shape with white glue and then position string or yarn on the lines. You will need large telephone books. Wrap them in colourful electrical tape to create large blocks children will enjoy climbing over. What's more, the blocks will be easy to wash. They can represent steps too. Create several blocks of different sizes. Fill spray bottles with a mixture of lukewarm water and food coloring. In winter, let children spray the contents of the bottles on snow to observe the changes that will occur. (Open educa-symmetry-Electricity) Print. Children must color the picture on the bottom to make it look exactly like the picture on the top. (Open educ-intruder-Electricity) Print and laminate. Children must identify the six items in the scene. Give each child a flashlight. Turn the lights off and close all curtains and blinds to make your daycare as dark as possible. 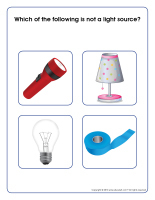 Encourage children to move around the daycare, using their flashlight to observe various objects. Stick glow-in-the-dark stars under a table. Cover the table with a blanket to create a simple hideout and hide as much light as possible. Children can take turns visiting the hideout to discover the surprise. Once everyone has had a chance to visit the hideout, replace the glow-in-the-dark stars with regular pictures or illustrations. Children will love to use a flashlight to explore them. Turn the lights on and off rhythmically. If the children in your group are very active, this is a great way to invite them to join you. Have fun using this light signal throughout the day to help children practice gathering quickly while helping them understand the importance of electricity. Turn all the lights off and unplug all electric appliances and items that you normally use. Invite children to experiment certain activities that require electricity such as watching a movie, listening to music, etc. They will quickly grasp the importance of electricity. Angélique Boissonneault offers a variety of early science activities with her friend Globule. Don't miss our Science section to find other experiments that are perfect for young children. Globule wonders... what is static electricity? Hypotheses: Ask children if they know what static electricity or "static" is. Ask them to name situations in which they observed static. For example, they may say clothes coming out of the dryer, lightning during a thunderstorm, tiny shocks we feel when we touch a friend, etc. Place confetti on a non-metallic surface. A wooden or plastic table is best. Comb your hair (which must be dry) for approximately 2 minutes. Place the comb near the confetti. Have your early childhood educator help you inflate your balloon and tie a knot. Rub your balloon vigorously with your piece of felt. Place the part of the balloon you rubbed with felt against the wall and let go. It sticks like magic! You can try rubbing the balloon on your hair too. Explanations: When you rub a plastic object, you charge it with electricity. This charge creates an attraction between an object (the comb or the balloon) and another object which is not charged (confetti or wall). The attraction lasts for a certain period of time after which the object gradually loses its charge and falls to the ground. Electrical discharge occurs when objects lose their charge too rapidly. This produces a tiny spark or shock. When the charge is greater, the discharge may cause a luminous flash of light. This is what happens during a thunderstorm. Hypotheses: Ask children what lightning is. Also ask them if they know why we always hear thunder after lightning. Allow them to discuss the subject. It may be interesting to show them pictures of spectacular thunderstorms. These can easily be found on the Internet. Place the ball of modeling dough in the very center of the pie plate. Press down hard so the dough sticks to the plate. From this point on, you must use the ball of dough to hold the plate. Do not touch the aluminum with your fingers. Turn all lights off. Make sure it is fairly dark in the room, but you must be able to see what you are doing. Deposit the plastic bag on the table. While firmly holding the pie plate by the ball of dough, vigorously rub it on the plastic bag for approximately one minute. Lift the plate. Bring the fork close to the side of the plate with your other hand. Do not let the fork touch the plate. Watch and listen. You recreated lightning and the soft rumble of thunder. Explanation: You created static electricity by rubbing the plate and the plastic bag together. In nature, when there are sudden changes in temperature, clouds fill with water and are charged with this same static electricity. When a cloud is filled with too much static electricity, it must get rid of it. It produces an electrical discharge: lightning. Lightning is a spark identical to the one you created, yet much bigger. Furthermore, as you noticed during the experiment, lightning is always accompanied by sound: thunder. This sound is also identical to the one you produced, only louder. You may be wondering why we always hear thunder a few seconds after lightning. Light travels through air faster than sound. Thunder and lightning occur at the same time, but the light from the lightning travels to your eyes faster than the sound of thunder travels to your ears. For this reason, the shorter the length of time between lightning and thunder, the closer you are to the storm. Pour milk in a pie plate. Add a few drops of several different colors of food coloring (the different colors mustn't touch). Add one or two drops of dishwashing liquid in the centre of the plate and watch closely to see what happens. Place all ingredients, except the ice cubes, in the jar of a blender. Mix them together at low speed for 30 seconds. Add the ice cubes and increase speed for 1 minute or until mixture is homogeneous. Strain preparation using a fine sieve to remove any seeds. Divide smoothie among a few tall glasses and serve immediately. 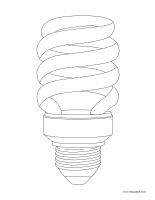 (Open models-Electricity) Print and let children decorate the lightbulbs as they wish. Cut them out and hang them within your daycare or near your daycare entrance. (Open puppets-Electricity) Print the models on heavy cardboard. Have children cut them out and decorate them with a variety of materials. Stick a Popsicle stick behind each one. 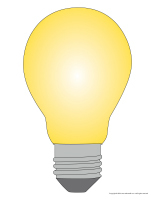 (I am learning to draw-A lightbulb) Print and laminate the model sheet. 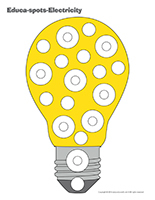 Invite children to practice their drawing technique on the model sheet before trying to draw a lightbulb independently. 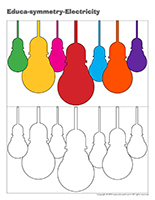 (Open coloring pages theme-Electricity) Print for each child.